The Korg Volca Modular is a semi-modular analog synthesizer that puts powerful modular synth potential in the palm of your hand. M.. 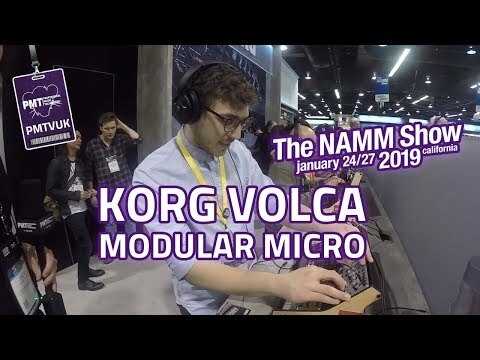 The Korg Volca Modular is a semi-modular analog synthesizer that puts powerful modular synth potential in the palm of your hand. Drawing inspiration from 'west-coast' style synth behavior, the Volca Modular features 8 analogue sound modules and a total of 50 patch points. By interconnecting each module you can quickly create bold, unique synth sounds anywhere, any time. The Korg Volca has established itself as a cult icon amongst synth aficionados and casual music creators alike. Since it's introduction, the Volca series has paved the way for portable synth design that remains quick to learn and fun to play. 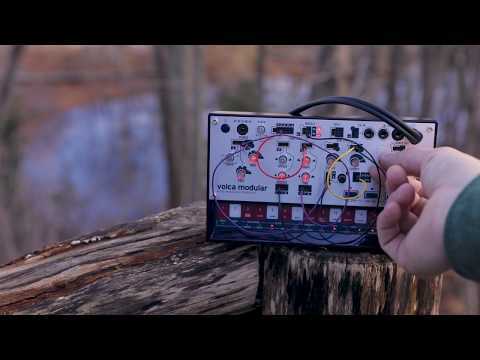 Volca Modular continues this traditon and makes modular synthesis even more accessible than ever before. 'West-Coast' style synths were based on oscillators such as FM modulation which generated numerous overtones, and used random and complex control signals and low-pass gate circuits to vary tonal character and volume, so that slight movement of a knob might dramatically transform the sound. While their potential was acknowledged, the resulting sound and its changes were difficult to predict, causing these synths to be used in a more experimental capacity. Volca Modular continues this tradition via these elements, including FM and PCM. The result is a truly unique sonic footprint that stands out from traditional 'east-coast' style synths that employ simple oscillators and filter modifiers. The Volca Modular is a semi-modular synthesizer consisting of independent analog synth modules, digital effects, and a sequencer. Each of the modules has been carefully selected for itsability to stand alone or be used in a modular signal path. Volca Modular’s modules are connected via the included pin cables, allowing a diverse range of combinations. The unit's compact chassis provides 50 patch points. Inputs and outputs are color-coded for recognition at a glance, and the signals are also marked by symbols to indicate audio, control, gate or trigger. Normally, each signal is connected according to its use, but on the volca modular, signal levels are universally compatible between modules, allowing hidden possibilities to arise from patching that defies common sense. Twenty pin cables are included with Volca Modular, and also included is a reference sheet explaining each patch point and providing basic examples of patching. Check out the 'Hear it in Action' Soundcloud Playlist on this page to hear what the Korg Volca Modular is capable of - or why not book a full demonstration and get hands on at your local PMT Store?